They say if you keep doing things the way you’ve always done them, what you get is what you’ve already got. Well, Monkey Shoulder does things differently, and what you get is something unconventional. You don’t make progress doing the same old thing. 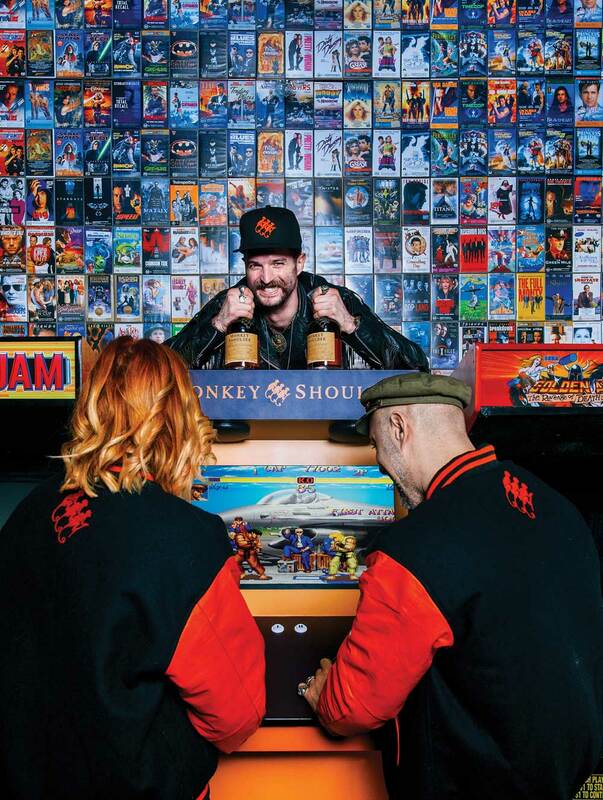 Take the Monkey Shoulder ‘On Like Donkey Kong’ Bartender Arcade Competition — it’s a cocktail comp but not as you know it, as there won’t be any cocktails shaken in anger on the night: it’s all about how well you can play classic arcade games. Monkey Shoulder is doing the bartender comps differently, because it’s in its DNA. It’s Scotch whisky, but it’s not stuck up — they want you to play with your whisky, not place it high upon the altar of snobbery. 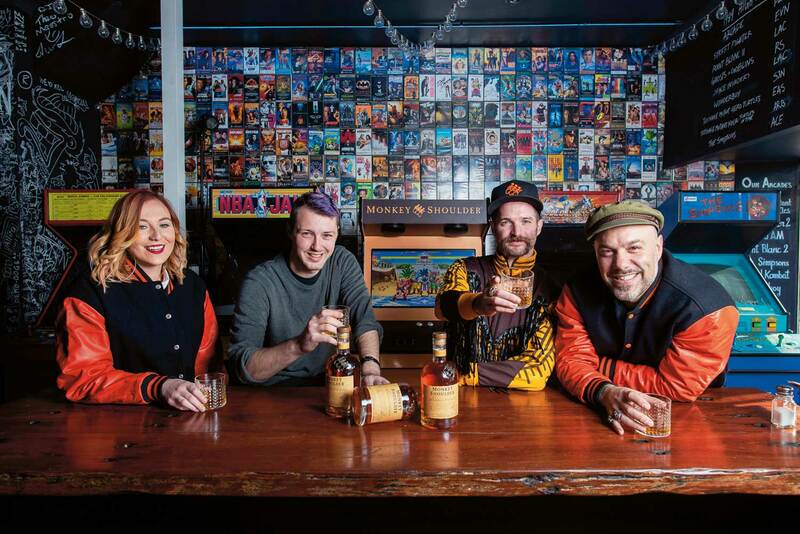 And National Monkey Shoulder brand ambassador, Mikey Lowe, wants to dispel some of the preconceptions and chicanery that crops up around whisky, so he’s asked four of Australia’s top bartenders how to dispel the myths and bring the fun to your next dram. From left: Rachael, Liam, Mikey & Max at 1989 Arcade Bar , Newtown. Do you think there are any preconceptions surrounding whisky and what are they? The preconceptions of whisky has dramatically changed now to what it was a few years back. I think a lot of it had to do with the ‘image’ in how they sold whisky in that it was mainly a ‘spirit’ marketed for old men with beards and moustaches and that to the non-observer all whiskies were big and smoky. Even the notion that if it doesn’t have an age statement or if it’s a blend then it’s just rubbish and not a ‘true’ whisky. Where do these myths come from? Marketing and more marketing. Whisky was never considered a ‘social’ drink as well. It was something you’d have in the middle of winter in front of a fireplace telling tales of yore. Kayla, how can we unlock whisky for our guests? I think the biggest thing we can do is educate. Educate ourselves and in turn our customers. As a bartender it’s part of our job and is really part of the overall experience. Give them a bit of insight or just have a chat about booze. People are more interested in alcohol these days, they’re drinking better and in turn want to know more about it. At Savile Row we’re lucky to have such a large backbar, and with so many bottles coming and going, we are always talking about or tasting new product. We can then pass that knowledge onto the consumer, it’s a platform to start the conversation. With unconventional whiskies such as Monkey Shoulder, are whiskies shaping the way you design your menus and challenge your customers? I don’t necessarily think whiskies are shaping the way we design our menus. We like a broad range and we have a team who has a deep passion for that sweet nectar. Although at times we like to go the slightly unorthodox route when it comes to writing menu items, it’s more about changing perceptions on what is typically regarded as a “whisky cocktail”. It doesn’t have to be upfront and boozy as hell. Tall whisky drinks can be light and refreshing, which we know, but the customer sometimes doesn’t. I wouldn’t say we challenge our customers per se, I’d like to think of it more as holding their hand as they go into a realm they feel less comfortable in, showing them something they’d never think to enjoy, encouraging them to be adventurous in their booze endeavours. Rachael, how can we unlock whisky for our guests? It’s all about what you know. If we as bartenders have the knowledge we can try to pass it on to customers willing to listen. Trying to move whiskey out of the age of middle aged men in suits with cigars is hard. In our industry we have accepted that this isn’t the case anymore but we need to get our customers to think this way as well. Most don’t care about the technical intricacies of whiskey making but laying down some cool interesting facts that they can relate to will always make people feel that they can understand what they are drinking just a little bit better. Describe whisky in a perfect world. In a perfect world, people would learn to not be intimidated by the idea of whisky, especially as there are so many to choose from out there. Single malt versus blended, Japanese versus Scottish, age statement versus non age statement — these are all choices that can overwhelm our customers and it’s up to us as bartenders to help guide people so that they can make the right choice for themselves. Are there any preconceptions around whisky? What are they? Well, not anymore — or much less then before. Yes, once upon the time if you were thinking whisky you may think of a grumpy old man smoking a pipe in a living room and sipping mediocre whisky, but I think the past decade or so we’ve see a new wave of whisky drinkers that like to try new stuff, leaving the cheap whisky behind and embracing the top shelf. I believe we are heading in the right direction. With unconventional whiskies such as Monkey Shoulder, are whiskies shaping the way you design your menus? Whisky cocktails are a thing now, we see bars dedicating their entire business to whisky — see the Dead Rabbit in New York, or The Baxter Inn in Sydney just to name a few. So the offering is changing to encourage consumers into this category, for example flight nights where you can test three or more whiskies so to understand differences in whisky. We’re seeing dedicated Old Fashioned pages where you pick your favourite whisky and your bitters to create something unique. For me whisky should been fun, should take you into a journey, should make you think but without stress — and it should taste amazing. 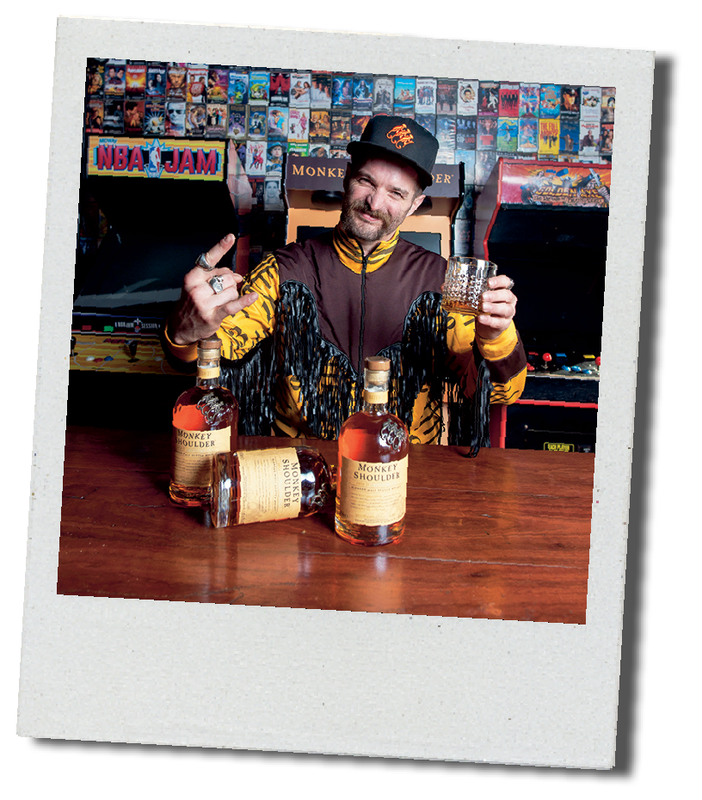 Monkey Shoulder National Ambassador, Mikey Lowe.